Nobody is going to come to save me. If I want a different life, I have to create it for myself. The danger about this state is that it's so easy to get used to. It is so often considered 'normal', which can make it difficult to want more without feeling ungrateful or unrealistic. I am all for counting my blessings and being grateful. But I'm also in urgent need of a life overhaul. Time to tackle all these things I KNOW I need to change to feel fully alive again! Time to find my way back to joy. If you have let things slide, becoming disciplined is often necessary to get there. It might be a cliche, but life really is too precious to be lived half-assed! And so, under the influence of the current Leo full (and blue) moon, I am committing to change things around. This is also why you are reading this post. Public announcements do wonders for keeping me accountable. Plus, I would love to have some company on this journey :). So please join me! Let's get out of the funk together! There will be daily updates on Instagram, and a weekly, honest (meaning I let you know how it’s going even if it’s not going well....) review on the blog. If you want to take part, comment on Instagram. You can use the hashtag #tbyl100. to get started, look at your life the way it is now. What do you know you ‘should’ change? I am currently coming out of a long period of slacking. Not enough green stuff. Too much pasta, bread and pizza. Too many sweet things. Plus, no exercise. So it's safe to say that I'm not in the best of shape. And that affects everything. My energy levels. The way I feel. The way I look. From now on, I will eat a lot healthier. I will start my mornings with a lemon water, followed by a green smoothie. There will be fruit until lunchtime, some protein and good fat (eggs, avocado etc) at midday, an apple with nut butter in the afternoon, and a veggie salad with quinoa or lentils in the evening. Or variations of these things of course. Plus, half an hour of exercise a day (I will start off with '21 Days to Phenomenal Abdominals', a Daily Om course by Jannine Murray. Much easier to get back to moving my body with an instructor, even if it's a virtual one :) ). These two go together, because I want to earn my money through creative expression. I really, really had it with just getting by financially with nothing left over to travel and do other fun stuff. Over the next 100 days, I will treat my creative endeavours like a business. No more constant creating without any marketing. Instead, I will create something I am truly proud of (The 'Seekers Journey', more on this soon). I know I could just market some 'old' stuff, but this doesn't inspire me at all. Once I am done, I will find (and actually DO!) marketing options that work and feel good to me instead of sleazy and fake. Kind of (nervously) looking forward to that one :). I want to feel more light and radiant and adventurous and excited. I want to dress up more. Go out more. Meet more interesting people and have more interesting conversations. And I definitely want to travel a lot more! For the next 100 days, I will eat well and exercise for at least 5 days a week. I am going to travel to 5 different places over the next 100 days (yeah!). I am going to make an effort to dress up and to look good! Just because it's fun to do, and I know I feel better then. And I am going to reach out to one new person I find interesting every week, either online or in ‘real life’. But I will do it anyway! And now over to you. What do you commit to? Over the next couple of days, I will share my attempts and methods of getting into these new habits on Instagram. Not sure yet myself how to best do that. Journaling? A calendar? A vision board? Meditation? All of those? And next Wednesday the first review post will come out. Which I am ignoring. After all, who is in charge here? (I can hear some sarcastic chuckle writing that one..). Please Join me. 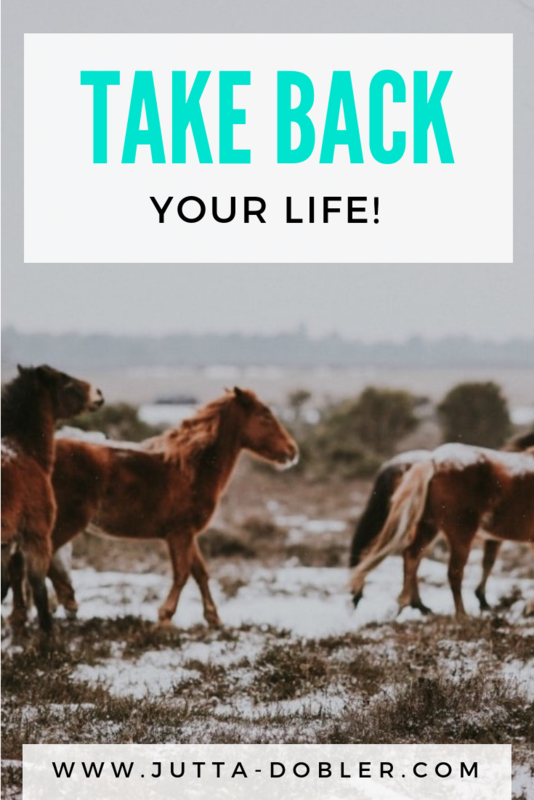 Let's take back the reigns and create a joyful life!